In the summer of 2013, a German online contest for green innovations, the GreenTec Awards became the stage for a most extraordinary public vote in favor of advanced nuclear energy. The list of winners of 2013, published on Wikipedia http://de.wikipedia.org/wiki/Greentec_Awards shows nothing of the uproar that took place when one of the contesting proposals appeared to be one for a nuclear power plant: the Dual Fluid Reactor (DFR). Hell broke loose. It’s nuclear, how can it be green! 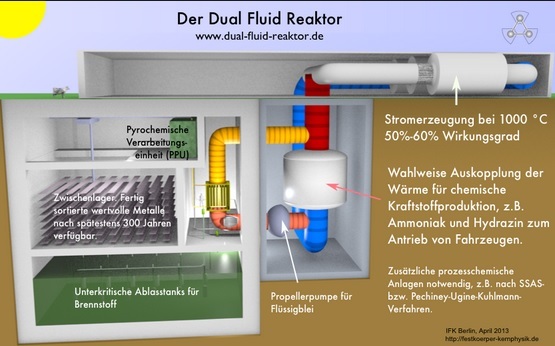 From what has later become known, the people that organized the GreenTec Awards must have been dismayed by what they saw happening: the Dual Fluid Reactor became the favorite of the public vote! In the minds of conservative German greenies, there is no such thing as sustainable nuclear energy. It’s nuclear, so how could it be green – using these two words in the same sentence is blasphemy, obviously. One senses: ‘our parents haven’t protested successfully against ‘Kalkar’ to find nuclear proposals in our green inbox. We haven’t swapped our nuclear light water reactors for coal plants to learn that nuclear does not produce carbon dioxide!’ [Saw similar quotes on webfora, have to refind them and adequately add sources-GZ] So the organization did what it felt necessary: it changed the rules of the competition. The DFR was excluded from the competition. The Institut für Festkörper-Kernphysik (IFK), who had had brought the DFR in the race, went to court, and won: http://dual-fluid-reaktor.de/eigenes/kfb-kammergericht-060114.pdf/view. However, the competition was over, there were no more prices to be won; the DFR had been effectively blocked out of the competetion. To the distant observer, it was the perfect anecdote to illustrate a discourse on nuclear energy that is deeply ideological and devoid of evidence. The chain of events was so remarkable that they deserve a full press coverage one day (please remind me!). On the internet, there is little to be read about it. Some of the information can be found on this German website of nuclear enthousiasts, search for DFR. And what did arouse the public’s enthusiasm for the DFR? This question is not difficult to answer. The German designers lived up to their national standards of Gründlichkeit when they wrote their introduction. It’s the figures that convince. To counter all discussion on how much energy is actually made available by their design, and how this compares to alternatives, the writers of the document use ERoEI: Energy Returned on Energy Invested. In recent discussions on energy we – fortunately – see this unit appearing more and more. ERoEI is a wonderful number because it’s so easy to understand: it’s simply a factor. ERoEI tells you: if you invest one kWh, how many kWh’s do you get in return? a) This value is calculated using the today’s enrichment technology and mix. Earlier values are lower because of energy-intense diffusion enrichment. b) The ERoEI for solar energy includes pumped-storage hydroelectricity, which is energetically most favorable, to balance day-night fluctuations (factor 2). This storage is unlikely to be applicable in the desert and has to be replaced by other storage means, further reducing the ERoEI. Damages by sandstorms are also not included in the ERoEI. hydroelectricity to balance short-term fluctuations (factor 2). Without those facilities, the ERoEI for wind at the german coast would be 16. The writers of the document provide a detailed calculation of the production cost per kilowatt hour for the Dual Fluid Reactor. As a reference, you can use the 2012 production costs (US) for a kWhr, produced through conventional nuclear, coal, hydroelectric and natural gas, respectively 3 – 2,5 – 1,1 and 3,6 (dollar) cents. For a 500 MWe DFR powerplant this is 1,15 cents per kWhr. For a 1500 MWe DFR powerplant this is 0,75 cents per kWhr. In this calculation the authors use a uranium price of 330$/kg – about four times the present market price. The share of the fuel cost is about 0,0165 dollar cent /kWhr. Meaning: with a uranium price of around 3000$/kg the fuel cost is still only 0,165 dollar cent/kWhr. These low production costs pave the road for producing synthetic fuel. Hydrazine is a good candidate. It has about half the energy density of Diesel, but thanks to its ability to easily mix with water, applying it in combustion engines results in very efficient operation. With a DFR, hydrazine can be made at a cost of 6 dollar cents per kilogram.